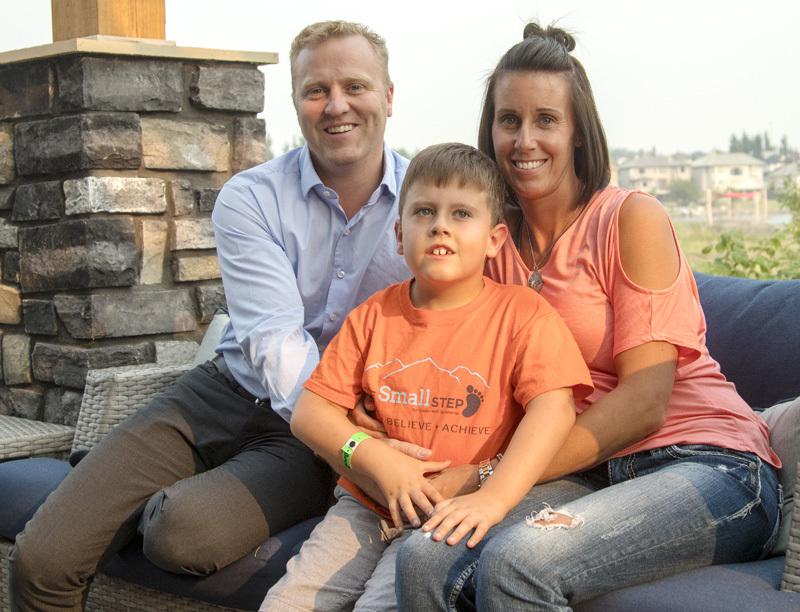 A Chestermere Family is organizing a charity golf tournament in support of the little known Prader-Willi Syndrome. Brooke and Scott Gibson began fundraising after their son Daniel, 7, was diagnosed with Prader-Willi Syndrome when he was just 10 day’s old. “Twenty-four hours in we knew something wasn’t typical,” said Brooke. Daniel spent about the first two weeks of his life in hospital before he was healthy enough for his parents to bring him home. As Brooke and Scott learned about the syndrome that their son had and just how rare it is they decided to start fundraising in support of Prader-Willi Syndrome research. “PW Syndrome is so rare, there’s not a lot of fundraising goes on for it,” said Brooke. “There’s their One Small Step walk, which is an annual walk that different cities throughout Canada participate in, but that’s the only real international [fundraiser],” she said. The couple decided that they wanted to do something that was more of a local fundraiser. “We wanted to do something that all of our friends and family could participate in,” said Brooke. Since Prader-Willi Syndrome is rare, it doesn’t receive the same s financial support of more common syndromes and diseases. “Somebody has to take the lead and we figure it might as well be us,” she said. “We’ve done fundraising events every year since he was born, and then last year was our first golf tournament and it was so much fun, and we did so well with it that we decided that we would do it again,” she said. This year’s tournament is being held on Sept. 8 at Lakeside Golf Club here in Chestermere. Tournament registration will open at 12:30 p.m. and start at 1:30 p.m. Following the tournament there will be a buffet dinner, silent auction, raffle and 50/50 draw. Last year’s tournament, which was held in Strathmore, raised just over $21,000. “We’re hoping to surpass that this year,” said Brooke. After expenses, all funds raised will be donated to Prader-Willi Research Canada. As they have worked to organize this year’s tournament, Brooke said that he support from the community has been tremendous. “We’re always so overwhelmed with the local businesses and local individuals,” said Brooke of the willingness of people to support the cause. “We’ve got some wonderful prizes for the raffle and the silent auction. “And a lot of the local businesses have been great about contributing,” she said. In addition to fundraising in support of research, the family also want to raise awareness of what Prader-Willi Syndrome is. “We have a big video that we show… so they know what PW Syndrome is,” said Brooke. “The more awareness we can create, the better. “We want Daniel to be a part of the community and we want the community to understand who he is,” said Brooke. According to the Foundation for Prader-Willi Research Canada, the syndrome is a genetic disorder that affects approximately one out of every 15,000 births. The defining symptom of Prader-Willi Syndrome is insatiable hunger. If this symptom can be managed, the lifespan for someone with Prader-Willi Syndrome is the same as those without it. For Daniel, the insatiable hunger symptom has not yet manifested but Brooke said that it could come at any time. “He definitely has an increased awareness of food, and an increased curiosity about food,” said Brooke. “He asks a lot of questions about what are having for snack? What did you have for breakfast? That’s a lot of his conversation topics,” she said. According to the foundation, other common symptoms, include small hands and feet, abnormal growth, small stature, very low lean body mass, early onset childhood obesity, hypotonia at birth, extreme obesity, and developmental delays. Brooke said that the most prominent symptoms that Daniel is showing are developmental delays. “Right now, I would say there’s a lot of more global delays, so the cognitive delays, the physical delays, speech delays,” she said. “He goes to tutor, and he’s got an aid at school, it’s a little more challenging for him to learn,” said Daniel’s dad Scott. Daniel also has scoliosis and is, according to his parents, the first child in Alberta to have had expanding rods surgically implanted to treat it. In the standard treatment, titanium rods are implanted, but since the metal doesn’t grow with the child, new surgeries are required every six months to lengthen the rods as the kids grow. For Daniel, the rods that were implanted can be extended with the use of magnets, bypassing surgery until he reaches the final length of the magnetic rods. “When I take him for lengthening, which is every 3 months, it’s maybe a 15-minute appointment,” said Brooke. “[He} jumps up on the table and they mark where the magnets are in his back and then they just use this machine externally that vibrates and then away we go,” she said. Other treatments Daniel undergoes includes nightly injections of human growth hormone, which helps with cognitive development and it also helps with his muscle tone. While Daniel does have a few more appointments and treatments than his two siblings, Brook said that his quality of life doesn’t suffer for having Prader-Willi Syndrome. And Daniel’s happiness and love of life helps to keep everyone’s spirits up in the household. “There’s days I’ve told Scott, you know I feel like that’s what keeps me going, I think I would have a harder time and I think I would feel sorry for him, if he felt sorry for himself,” said Brooke. “But it’s so hard to feel bad for him when he’s so happy and just easy-going and he just lives,” she said. These coping skills are important because according to Scott, their son will probably always be living with them. “Historically, they, kids or people with PW live in group homes, or with their parents as long as they can,” he said. “They’re generally in spaces where your cupboards are controlled, and your fridge is locked,” he said. With organizing the golf tournament and working to raise awareness, Brook and Scott are hoping to break down any barriers to Daniel being able to be fully seen as a member of the community. “We just want [Daniel] to be accepted in the community and be embraced and so far, that’s been our experience overall,” said Brooke. She said that she’s always happy to answer people’s questions about Prader-Willi syndrome and her son. “Because knowledge is power, and I would so much rather have you ask questions and learn than to just make assumptions about who he is,” she said. “Cause he’s quirky, not any different than most kids, he’s got his quirks,” said Brooke. When it comes to researching Prader-Willi Syndrome, Brooke said that since it’s in her son’s DNA there won’t be a cure but there are some exciting treatments being explored. The research process is slow but seems to be moving in the right direction, which is why fundraisers like the gold tournament are so important to keep the research funded. “It’s a long, slow process, because it’s such a rare syndrome, but there are things happening, so we have to remain hopeful,” she said. As of the week of Aug. 13, Brooke said they had over 80 people registered for the tournament with another people who have said they will register. There’s still room for individuals or groups to register as Brooke said that the capacity for the tournament is 144 people. For more information go online to www. fpwr.ca or e-mail Brooke at brookrgibson@gmail.com.